Our house also offers accommodation (rooms), we often get athletes, families and businessmen staying with us from all over the world. Their commendable comments on the web have made us proud, but also oblige us to continue working even harder and providing an even better service. Our house is located in a small village over the city, surrounded by forest. You can expect peace and plenty of fresh air. We offer two double bedrooms and a small studio with kitchenette, which is suitable for 2 to 4 people. Our accommodation comes with breakfast. -Guests use free parking directly in front of the inn. 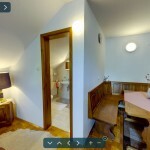 Check virtual tour to be sure what can you expect.